One of the rules of outdoor cooking is that you should always have plenty of food. And when you’re filling your pellet grill to the brim, that’s usually not a problem. However, what if we told you there was a way you could fit even more in your favorite grill or smoker? It’s true. All you need are a few jerky racks, and the possibilities for your pellet grill cooking open up even more. As mentioned earlier, jerky racks are perfect for creating some extra cooking surface area in your pellet grill or smoker. But they’re also handy for a few other cooking jobs. As fish cooks, it becomes tender and flaky. This can be a problem if you’re cooking on top of the wide standard grates on a pellet grill. Your filet could fall apart and fall into the grease tray below. Asparagus, peppers, squash, and every other veggie come in unique shapes and sizes—which means the standard grates might not be a one-size-fits-all solution for your side dishes. Rather than roasting your sliced veggies or other small foods like nuts and seeds on a baking sheet inside the grill, you can get that all-around smoke flavor with a jerky rack. Of course, jerky racks are perfect for cooking their namesake: jerky. The thin strips of meat probably won’t fit the regular grill grates. Also, with more jerky racks you can fit more jerky in the grill or smoker at one time. 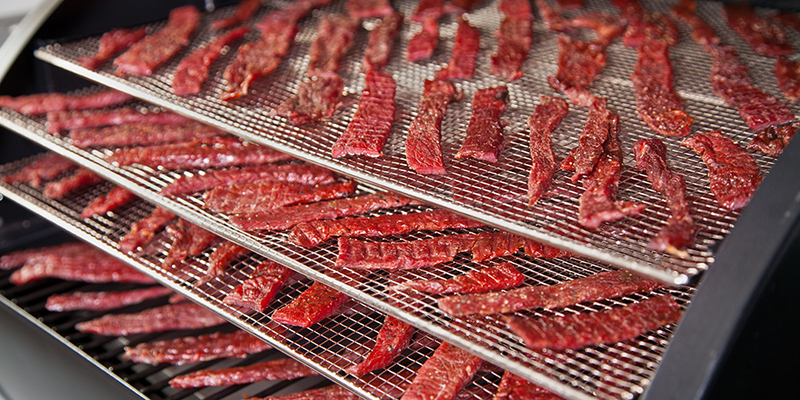 Make a big batch of jerky all at once instead of rotating through several. The fine mesh of the jerky racks is great for holding food that doesn’t fit the regular grates—but it’s also what makes these racks a little trickier to clean. Luckily, we have a few tips to make clean-up a breeze. ● Before you cook anything, spray your jerky racks with a thin layer of cooking spray or Cast Iron Conditioner. This coating will prevent food from sticking and creating a mess later. ● Rinse and scrub the racks while they are still warm. If you can get off some of the cooked-on food before it cools and hardens, your clean-up will be easier. ● If a simple scrub brush or dish cloth isn’t working, use a chain mail scrubber to get the stubborn bits of food off. ● For even more stubborn messes, leave the racks soaking in hot, soapy water for 20-30 minutes. ● Dry with a towel and then set in an open-air rack to dry completely before storing.